You can add an animated GIF (or meme) to a PowerPoint slide as you would with any other picture file. You can insert a GIF file that is stored on your computer hard disk or in OneDrive. Select the slide that you want to add the animated GIF to. In the Insert tab of the ribbon, click Pictures. 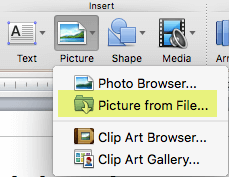 In the Insert Picture dialog box, navigate to the location of the animated GIF you want to add. Select the file, and then click Insert or Open. You can also search the web for GIFs by using Insert Online Pictures or Insert Clip Art, depending on your version of PowerPoint. On the Insert tab of the ribbon, choose Insert Online Pictures or Insert Clip Art. Type "animated gif" in the search box. Animated GIFs often loop repeatedly without end. But you can change that by editing the GIF before you add it to your PowerPoint slide. Once you have the GIF file saved to your computer, a relatively easy way to edit the GIF is with the online editor called ezgif.com. 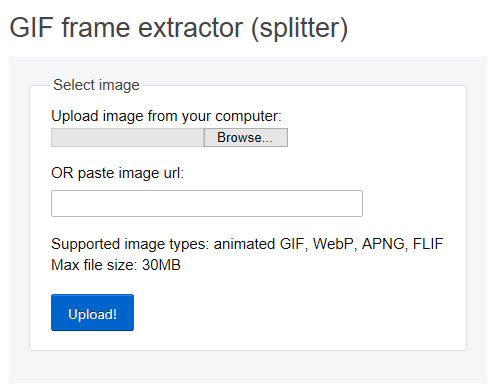 Go to the GIF frame extractor (or "Splitter") on ezgif.com. Under Upload image from your computer, click the Browse button to locate the GIF file on your computer. Select the file and then select the Open button. 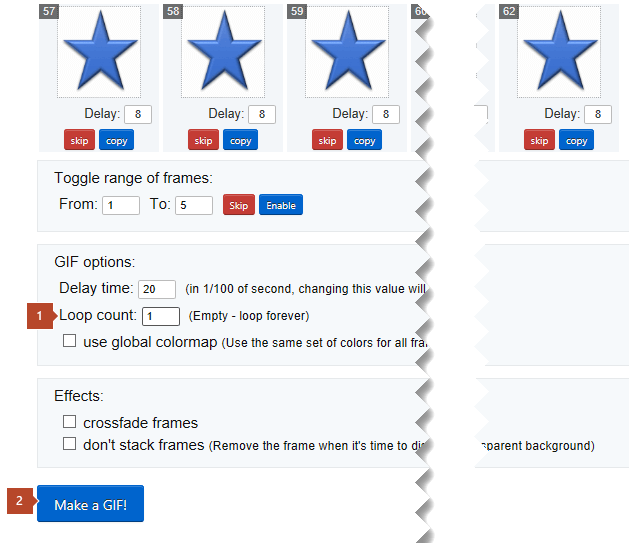 Click the Split to frames button below the animated GIF. After a moment, a frame-by-frame breakdown is shown on the web page. Below the many frames (scroll downward on the page as needed), there's a blue Edit animation button. The set of frames appears again, with a Skip, Copy, and Delay option for each frame. Below the frames are more options, including one for Loop Count. Under GIF options, in the Loop Count box, type a numeral representing the number of times you want the GIF to play. After a few moments, the revised GIF is shown below the Make a GIF! button. Below the revised GIF is a row of buttons, and the far right one is named save. Click save to copy the revised GIF back to your computer. Depending on your browser, the file will be saved to your Downloads folder or you'll be allowed to specify where you want the GIF file to be copied to on your computer. With the revised GIF on your computer, you're ready to insert it on a slide in PowerPoint. You can add an animated GIF to a PowerPoint slide as you would with any other picture file. You can insert a GIF file that is stored on your computer hard disk or in cloud storage (such as OneDrive). On Home tab of the ribbon, under Insert, click Picture > Picture from File. Navigate to the location of the animated GIF you want to add, make sure the file name ends with a .gif extension, select the file, and then click Insert. To play the animation, select the Slide Show menu and then select Play from Current Slide. You can add an animated GIF to a slide by using PowerPoint Online, just as you would with any other picture file, but the GIF won't play when the presentation is viewed in Slide Show. PowerPoint Online can't play animated GIFs. 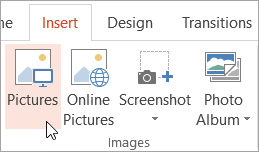 If playing GIFs is a feature you'd like to see in PowerPoint Online, please vote for it in the PowerPoint Online suggestion box. Select the slide where you want to insert an image. On the Insert tab, select Picture. Browse to the picture you want to insert, select it, and then click Open. After the picture is on your slide, you can resize it and move it wherever you want.